While some artists are content to examine, unpick and rework formal and conceptual aspects of their chosen subject, occupying the quietly confident domain of subtle and elegant historical references, updating them with poise and savvy, others make it their business to cry out, demanding attention for their latest hobbyhorse, and rupturing the serenity of the library with a marching band and a chorus of acolytes banging wooden spoons on old pots – making some noise. Consider the following fact: in April 2005, the UK Parliament passed the Serious Organised Crime and Police Act, one provision of which restricts the right to demonstrate within an exclusion zone of up to one kilometre from any point in Parliament Square. The area includes Whitehall, Downing Street, Westminster Abbey, the Middlesex Guildhall, New Scotland Yard, and the Home Office as well as County Hall, Jubilee Gardens, St Thomas’ Hospital and the London Eye on the South side of the river Thames. 1. In December 2005, a man walks backwards from Parliament Square down Whitehall wearing a T-shirt bearing the slogan “this is not a protest”. No Protest is a performance by Mark McGowan. 2. 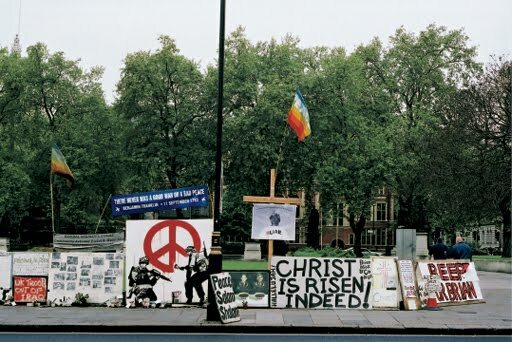 In January 2007, Tate Britain opens State Britain, an installation that recreates, within the Duveen Galleries, the one-man peace-camp set up by Brian Haw on Parliament Square in 2001, to protest sanctions against Iraq. The work is by Mark Wallinger. These two works respond to the same law, which seriously curtails the right to free speech within a designated zone, but they do so in dramatically different ways. In one work, the artist acts alone, constituting both the form and content of the work. Publicity for the work consists of a press release written by the artist and personally emailed to journalists. The other work is situated within and sanctioned by the institutional apparatus of the state-funded gallery of British art, eventually winning its author the 2007 Turner Prize, the most prestigious and well-publicised contemporary art prize in Britain. Wallinger’s State Britain was a meticulously made replica of Haw’s peace camp, as it was on the day it was dismantled and seized by 78 members of the Metropolitan police in May 2006. Each detail – from banners to photographs and personal messages – was carefully reconstructed, to create an uncanny simulacrum of the protest site within the neoclassical setting of Tate Britain. The work diverged from the original in only one aspect: a black line taped on the floor and running through the middle of the work to demarcate the edge of the 1-mile exclusion zone stipulated by the act. Ironically, given the absolute realism of the reconstruction of the peace camp, the line was a fiction, pure artistic license, and symbolised the circular mile circumference of the exclusion zone, rather than the actual zone, as demonstrated by Charles Thomson, a co-founder of the Stuckists, who showed that the exclusion zone actually ended at Thorney Street, some 300 yards from Wallinger’s limit. In any case, State Britain offered people who, for whatever reason, hadn’t engaged directly with Haw’s camp while it was still in Parliament Square the chance to get close to a version of one of the most spectacular and enduring protest sites in London. It is interesting to note that Haw still occupies the same spot on Parliament Square at the time of writing, some eight years after he first set up camp, though on a much reduced scale. The work transformed a performative, demonstrative and active site into a document, abstracting it from the uncomfortable and messy human realities in which it was originally created, removing it from the unsettling gang of police officers patrolling outside the Houses of Parliament, and inserting it into the spectacle of contemporary art. The dual nature of the work’s relationship to the sanctified domain of a state gallery of art added to the piquancy of its conflicted identity: it simultaneously challenged state policy in Iraq and owed its very existence to state sponsorship of the arts. Wallinger’s hands-off approach to making State Britain was evident in the hiring of an art fabricator to remake it. What was originally an accumulation of people’s personal additions to the camp, weathered and worn, was, for the work, artificially aged, scientifically calculated and clinically installed in a gallery context. In replicating Haw’s peace camp in a realist style, Wallinger opted performed a 1:1 mapping of the original. Although Wallinger claimed that State Britain was a document of the peace camp and Haw’s work on one level, it functioned more as a memorial for the original, standing in for the original and commemorating its destruction, inducing a hushed reverence in the viewer. This was in part due to the shocking nature of the content of some of the placards and photographs included in the protest site. State Britain also sacralised the peace camp, fixing it in a particular form, and solidifying it by consecrating it to the art historical canon, even though Haw’s peace camp carried on in much reduced form on Parliament Square. State Britain invited members of the general public to engage with a particular moment and persona, frozen in time and place, within the marble hall of the Duveen Galleries. State Britain bestowed an aura on Haw’s camp, elevating it from the potent consciousness-raising exercise and performative protest that stood on Parliament Square to a formal and aesthetic representation of that reality. State Britain ended up being a symbol of the original peace camp, and while symbols have their function and power, they are usually static and lack direct implication with reality. McGowan’s performance operated in a dual and inherently contradictory way: as both a straightforward protest and its exact opposite. The slogan on the t-shirt worn by the artist during the performance reads ‘This is not a protest’, a slogan that pays tribute to a formula from one of the most famous works by Belgian surrealist René Magritte’s. The iconic painting La trahison des images (The Treachery of Images), 1928-29, depicts a pipe with a caption that reads ‘Ceci n’est pas une pipe’ – ‘This is not a pipe’. Despite first impressions, the image and its legend are not contradictory for this is indeed not a pipe we see; it is a picture of a pipe. As Michel Foucault states in his essay titled after Magritte’s painting, ‘To paint is not to affirm’. The bathetic nature of the performance is further borne out by the conversation that ensues, in which the female officer, fulfilling the motherly stereotype, saying “you haven’t made any protest to me, and all I can say is that it’s very cold and if I were you I’d put your coat on, okay? But if you wish to walk backwards, as long as you’re safe doing it, I really don’t have a problem.” By proclaiming his own fallibility and impotence, the work celebrated the fact that failure is that which gives meaning, clumsiness that which lends elegance to an argument, and in the final analysis No Protest constituted one of the most direct and cunning challenges to the new law. No Protest refused to operate within the logic of the structures it challenges, speaking an entirely different language and invoking the perverse power of the absurd. It effectively neutralised the anti-protest laws through laughter and ridicule. In performing the work, McGowan appeared not even to take himself seriously; a recursive gesture which constituted an essential part of the work, reducing the law – and himself – to a joke at which he can laugh rather than railing against. This attitude stands in stark contrast to Wallinger’s predominantly silent presence in the creation of State Britain; a difference that signals the distance between one artist’s adoption of performance and another artist’s strategies of re-presentation. Despite its title, No Protest constituted a protest, in its most crystalline form. In contrast, State Britain functioned predominantly as a representation of protest, though it could be argued that, through its insidious position within a state institution and extrapolation of the funding relationship between the government and Tate, it might actually be an extension of the original protest. However, Wallinger’s hands-off approach to reconstructing the peace camp and the utter realism of the work might also suggest a certain complicity with the state apparatus. One might have imagined a more daring work being a reconstruction of the peace camp installed overnight in a guerrilla action on the site of the original – a true challenge to authority. By replicating Brian Haw’s peace camp within the walls of Tate Britain, Wallinger made a solemn and straightforward indexical gesture towards the original and its intentions, but it operated in the domain of representation, and lacked the potency of the original camp. McGowan’s performance, in contrast, constituted a protest precisely by stating contradicting itself. State Britain and No Protest demonstrated the difference between a work that says something and a work that does what it says it does; the difference between a document or commentary and a performative statement or gesture. This entry was posted on August 28, 2009 by ellendw.